Common Names: Bull shark, Zambezi shark, Lake Nicaragua shark, Cub shark. Identification: Heavy set body. Broad, short snout. Eyes proportionately small. First dorsal large and pointed. Upper body uniformly grey fading to paler grey on the belly. Tips of all fins and trailing edge of caudal fin are sometimes dusky. No interdorsal ridge. Size: Maximum length 340cm. Size at birth 56-81cm. Habitat: Turbid inshore waters, lagoons, estuaries, freshwater rivers and lakes, coastlines, and reef environments down to 150m. The Bull shark is famous for its habit of occasionally swimming upstream hundreds of miles in some river systems such as the Mississippi, Amazon, Zambezi, and Lake Nicaragua. Abundance and distribution: Circumtropical and subtropical. Behavior: Diet consists of many food types including bony fishes, turtles, seals, crabs, and squid. 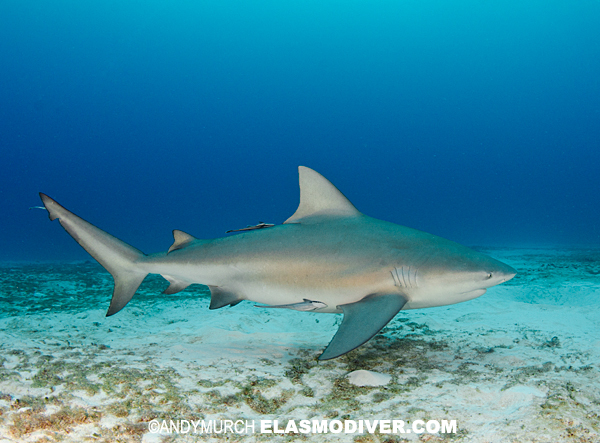 Adult Bull sharks are especially keen on other elasmobranchs. Hunting may take place in both salt and fresh water habitats. Reproduction: Viviparous. Recorded litter size 1 - 13. Gestation period 10 - 11 months. Observations: Bull sharks have been observed lying motionless on the seabed as if sleeping. No explanation for this desire to rest is immediately obvious. Photographs: Playa Del Carmen, Mexico. Similar species: In the Caribbean Sea the Bull shark is often confused with the Caribbean reef shark (C.perezi) which is not as heavy bodied and has more distinct markings. Many carcharhinids are superficially similar to the bull shark and attention to fin coloration and overall body proportions are important clues to species identification. Of a similar size or even bigger than the bull shark is the Dusky shark (C.obscurus). The Dusky often has very little identifying markings but has a longer and more pointed snout than the Bull. 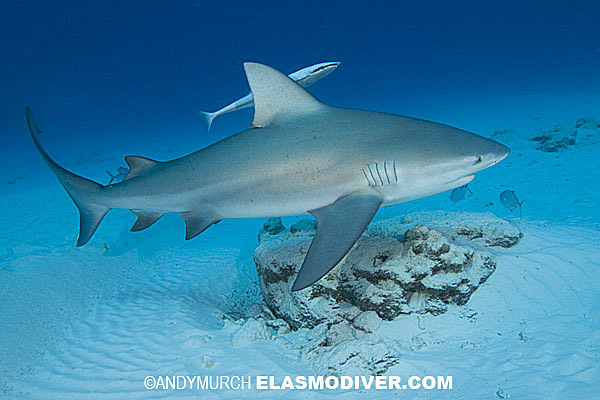 Reaction to divers: Although Bull sharks have been implicated in many attacks on bathers, divers are normally not harassed unless they are spear fishing. Dr Erich Ritter was bitten 'on camera' during a shark feed at Shark Beach in the Bahamas. The incident resulted in the lengthy documentary - Anatomy of a Shark Bite. Diving logistics: There is now a new Bull Shark feed in Playa del Carmen, Mexico. Phantom Divers in PDC take divers out to the feed which is in 80ft of water. Up to 24 sharks sometimes visit the feed from November to the beginning of March. Shark Beach AKA Bull shark Beach at Walkers Cay in the Bahamas was at one point the best location for viewing Bull sharks in the world. In 2003 it was closed. Erich Ritter's injury was probably a contributing factor to the closure but the entire resort fell victim to a fierce hurricane. Another excellent area for Bull shark encounters is the Coastline of southern Africa around Protea Banks, and Aliwol Shoal. Many operators service these areas from South Africa and Mozambique and a list of companies can be found in the elasmodiver links section. Any recommendations from divers of specific outfits would be welcome. Scott Williamson writes from Koh Tao, Thailand: Just north of the island is a dive site called Chumphon Pinnacle and since October bull sharks have been spotted on this site nearly everyday. I'm told they hang around till the end of February every year and then return in the fall.